Before going any further, it’d first be a good idea to clear up a common complaint (if you could call it that) on this subject that often comes up, in that the five original sailor soldiers are often referred to as the “inner” senshi (内部太陽系戦士; naibu taiyoukei senshi), a title which supposedly corresponds to the concept of the “inner” and “outer” planets1 in our solar system. Since the cutoff point between the inner and outer planets is the asteroid belt between Mars and Jupiter, this would explicitly prevent Makoto from belonging to the team. 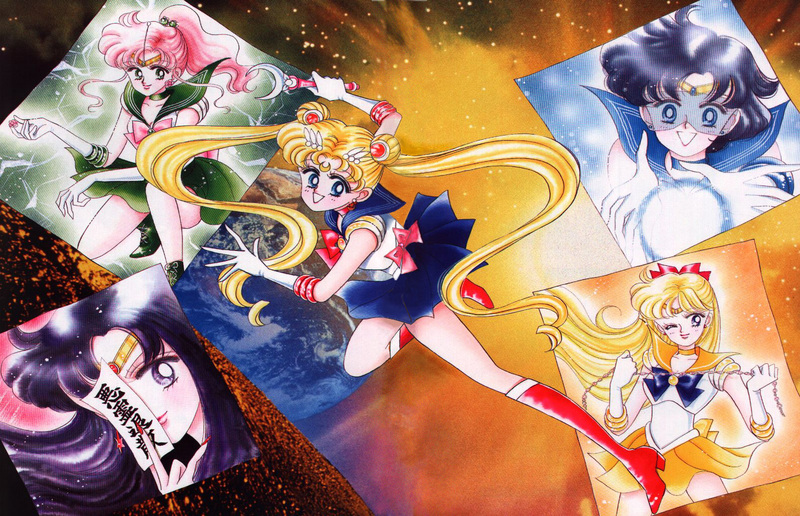 However, the term “inner senshi” didn’t come up until Sailor Moon S and beyond (when Uranus, Neptune, and Saturn joined), so this was likely more of an oversight and a desire to fit astronomy back into the structure of the team and not actually a factor in the creation of the original Sailor Team. The simplest explanation is that the four planetary guardians plus Princess Serenity are intended to correspond to the four kings and Prince Endymion. As previously discussed, the Four Kings come from Buddhist tradition and refer to the four gods governing over the four compass directions. Since they obviously have a fixed number, one could easily make the assertion that the four members of the Sailor Team were chosen to match up with the kings of the Dark Kingdom and balance out both sides. When you take a look at other Japanese media, however, I don’t think this is the case and, in fact, it’s more likely that the four kings themselves were chosen to match up with the full Sailor Team. Why’s that? Well, as anyone who grew up in the early 90’s (and probably through today) could tell you, Japan has an incredibly long-running series of transforming superheroes who use a mixture of martial arts and magical powers to fight the forces of evil known as the Super Sentai Series (スーパー戦隊シリーズ) in Japan and as Power Rangers in the West. This series has been running since 1975, when Himitsu Sentai Gorenger (秘密戦隊ゴレンジャー)2 first debuted on TV Asahi, and has been a huge influence on pretty much every team-based fighting superhero series to appear ever since. 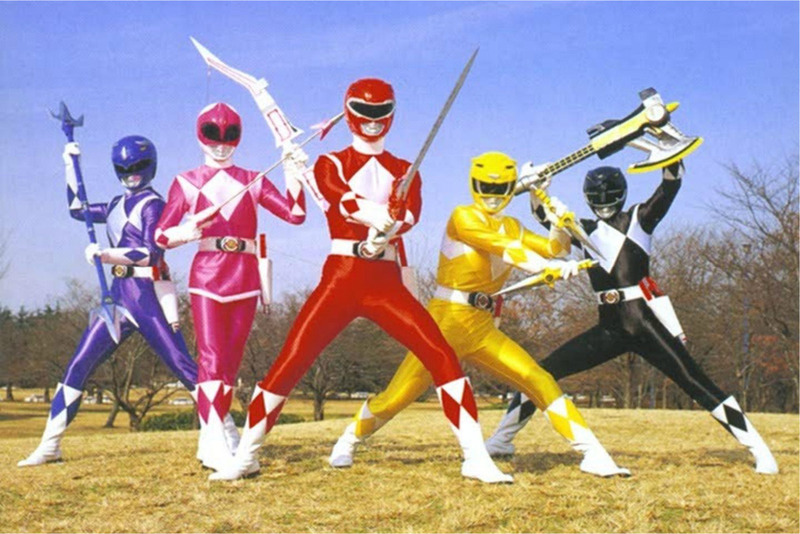 The concept at its most basic core is that they are a team made up of five members, each with a very similar uniform which differs only by their primary colors. Not only was Ms. Takeuchi apparently a big fan of these shows, but they were also produced by Toei and aired on TV Asahi – the same companies which produced (in the case of the movies) and aired Sailor Moon, respectively. It wouldn’t be too much of a leap to assume that TV Asahi asked for five team members during the initial negotiations with Ms. Takeuchi when planning the debut of the Sailor Moon manga and anime. Read also: Is Usagi Really Just an Average Girl? While we could just leave this off here and that say that the inspiration for the initial five members of the Sailor Team was in the long-running Super Sentai Series, I feel it would be a bit too easy to just leave it off here. This answers the direct question behind where significance of five comes from for Sailor Moon directly, but why is it that Toei chose this number for the Super Sentai Series in the first place? Three is too few, and four is unlucky. Seven is way too many. There may be some other reasons out there for why Ms. Takeuchi decided to structure the Sailor Team in the way that she did, but at the very least this provides a nice contextual explanation for how the team of inner senshi came to be as we know it today. Who would have guessed that something as simple as this could have been tied all the way back to old kabuki plays dating back to the Edo period! ← Would it be Legal for Mamoru and Usagi to Date? They must have overcome the superstition of four being unlucky as there have been quite a few PreCure teams with just 4 members. I mean, it’s not to say that Japan never does four anything ever. Chairs still have four legs, buildings have a fourth floor (though in Taipei, I’ve actually encountered some buildings that omit floors with a 4 in them), but as a starting point it’s typically something that’s avoided. I think a more direct explanation is that Mercury through Jupiter were the planets known to antiquity, so they have increased significance since they have ties to the five elements, etc. I wonder why Usagi’s colors were settled on as blue/red (pink) and not just pink to better balance out the Sentai feel? Her costumed seems pretty close to Wonder Woman’s (tall boots with white trim, blue skirt, a throwable tiara with a red gem). I love the red (pink! 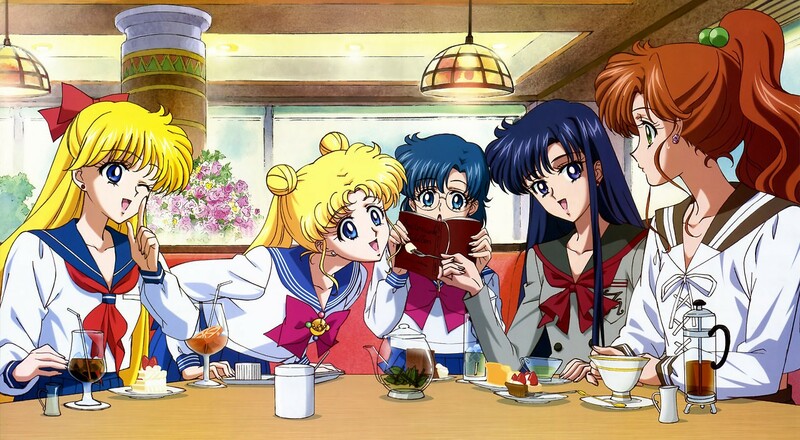 ), white and blue of Usagi’s costume, but it often seems odd that so many senshi wear a blue skirt. My theory would be that blue just evokes a navy/marine/sailor image and is often a default color for sailor fuku so for the default senshi, blue was just the best choice. I can’t imagine her appeal being so explosive if pink had been her default color scheme. The design for Sailor Moon was meant to be as close to normal school uniforms as possible (white leotard, blue skirt, red bow), so it makes sense that her design ended up looking that way. Which also explains why she looks so much like Sailor V, too.